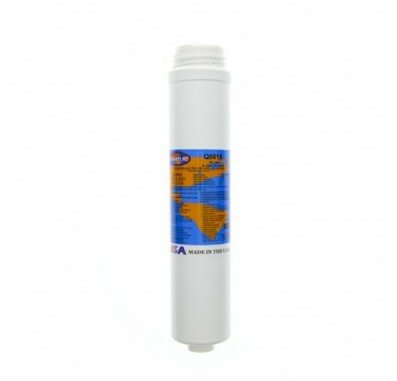 The Omnipure Q5615-P is a 1 micron Carbon Block Lead Reduction Water Filter with Phosphate Scale Inhibitor. The Omnipure Q5615-P Carbon Block Lead Reduction and Scale Inhibitor water filter is very user-friendly. Replacement of the spent media bed is done quickly by detaching the filter body from a permanent head with a twist of the wrist. The new Q5615-P filter body is just as easily threaded into the head and the replacement is then complete. The Omnipure Q5615-P is also available with the optional Twist Tap in-head valve system, which automatically turns the supply water off when the body is disconnected from the head. The Omnipure Q5615-P can be used as a pre or postfilter for Reverse Osmosis Systems, beverage equipment, drinking water fountains, ice machines, and other point-of-use applications. The Omnipure Q5615-P GAC lead water filter and phosphate scale inhibitor is a granular activated carbon block filter used to reduce cysts, lead, scale, taste, odor and chlorine taste and odor.